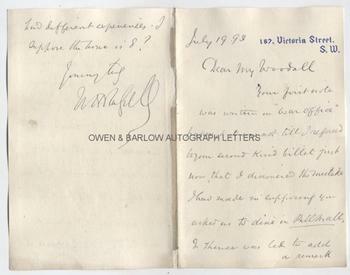 WILLIAM HOWARD RUSSELL Autograph Letter Signed. Irish born journalist and war correspondent. ALS. 3pp. 167 Victoria Street, SW. July 19th 1893. To [William] Woodall. Together with a fine contemporary portrait photograph. 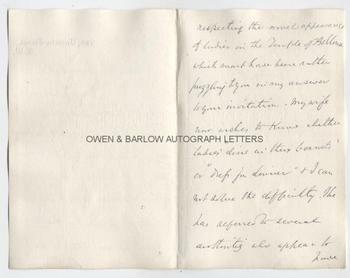 "Your first note was written on 'War Office' paper, & it was not till I referred to your second kind billet just now, that I discovered the mistake I had made in supposing you asked us to dine in Pall Mall. I thence was led to add a remark respecting the novel appearance of ladies in the Temple of Bellona which must have been rather puzzling to you in my answer to your invitation. My wife now wishes to know whether ladies "dine in their bonnets" or "dress for dinner" & I can not solve the difficulty. She has referred to several authorities who appear to have had different experiences. I suppose the hour is 8?" 8vo. Approx 7 x 4.5 inches. Mounting traces to right edge of last leaf, else fine. 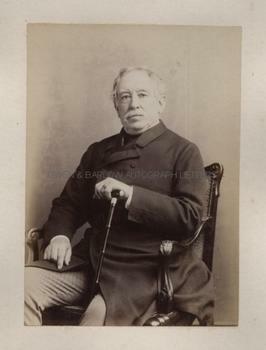 The portrait is a fine 19th century silver print photograph measuring approx 6 x 4 inches (excluding mount). It shows William Howard Russell half-length, seated, with one hand resting on his walking cane. It is laid down on card from an album leaf and is in fine condition. William Howard Russell, known as "Willie Russell of the Times" is regarded by many as being the first modern war correspondent, although he, himself, disliked the term. He covered many foreign wars for 'The Times' but it was for his reporting of the Crimean War for which he will be most remembered. Florence Nightingale said that it was due to Russell's reports of conditions in the British camps that she entered into wartime nursing. William Howard Russell was generally liked by most British soldiers but was despised by their commanders, who called him a "vulgar, low Irishman". This, and more accurately, his truthful and public influencing reports, caused commanders, such as Lord Raglan, to blacklist him and order their officers not to speak with him. Nevertheless, he covered the whole of the campaign, including the Battle of the Alma, the "thin red line", the siege of Sevastopol and the Charge of the Light Brigade. He went on to cover the Indian Mutiny (witnessing the recapture of Lucknow), the American Civil War and the Franco-Prussian War. He retired from war reporting in 1882 and founded the 'Army and Navy Gazette'. When William Howard Russell was knighted by Edward VII, the king is reported to have said "Don't kneel, Billy, just stoop." Both the letter and the photograph are from a 19th century collection made by the radical Liberal M.P., William Woodall. 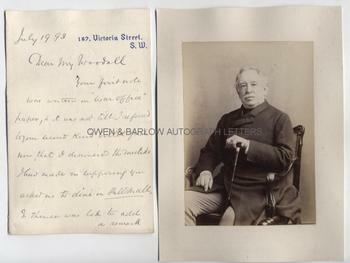 Woodall was variously Surveyor-general of the Ordnance and Financial Secretary to the War Office under Gladstone. It seems that William Howard Russell had thought he and his wife were being asked to dine with the War Office (the "Temple of Bellona" being a reference to the Roman goddess of war), whereas it is probable that he was actually being asked to dine at the House of Commons.